An alien has tampered with the past, killing K years ago, long before J would have met him, and J must travel to the past to correct history. 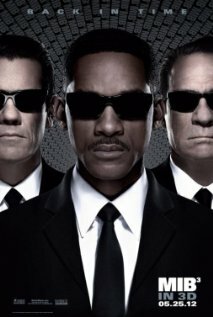 This idea for comedic temporal disaster is the core plot of Men in Black III, slated for U.S. release May 25, 2012, with trailers now showing in theaters. The covert operatives J and K are again played by the conveniently anonymously-named Smith and Jones, with Josh Brolin playing a credibly realistic younger Tommy Lee Jones when Will Smith visits the past. Several other familiar faces, including Rip Torn as Zed, are joined by newcomers including Agent Oh in Emma Thompson's older and Alice Eve's younger versions. Preliminary information suggests that the story will be a time travel nightmare, but the pleasure of the Men in Black franchise has always been that everything is absurdly ridiculous and the characters treat it as not merely serious but perfectly normal. TheExaminer.com looks forward to being able to bring a full temporal analysis to its pages once the film becomes available.